Founded in 1987, SRG Bangladesh Limited (SRGB) is the leading multi-sector and full-service research and consulting house of Bangladesh. SRGB offers professional services in management consulting, analysis and research (both quantitative and qualitative), mystery shopping, project designing & management, project monitoring & impact evaluation studies, investment feasibility studies, communication and training, etc. We support our clients through independent analysis, research, and competent consulting to shape their response to the challenges of sustainable development. We continually seek out new ideas and assess their possible impact on future business. In close cooperation with our clients, we develop and implement ground breaking and innovative solutions. 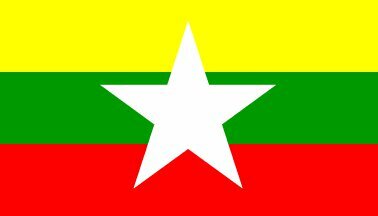 SRGB maintain a network of professional experts and firms worldwide and has substantial experience in undertaking research and studies in the region covering Bangladesh, India, Nepal, Sri Lanka, Pakistan, Afghanistan, Myanmar, etc. SRGB has successfully undertaken hundreds of large scale nationwide surveys and public perception studies and opinion poll on various business and social issues for many international and local organizations. SRGB has extensive experience in undertaking baseline surveys, impact evaluation studies and social research on diverse sector in Bangladesh and other countries of the region. Probably SRGB is the most experienced consulting house in Bangladesh who possesses extensive and in-depth knowledge on the trade and business environment of the country. We have advised many local and multi-national companies in designing industrial projects and support the clients to take the investment decision. 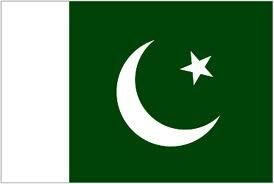 SRGB conducted hundreds of sector/sub-sector studies on diverse sectors, including banking & finance, education & training, health & population, environment & climate change, agriculture & fishery, energy & power, telecommunication & ICT, textile & garments, etc. during last about 30 years. SRGB specializes in designing sector investment planning and financing strategies. We have frequently been commissioned by many local and multi-national companies for undertaking investment climate assessment studies on diverse sectors to advice on the investment scenario, prospects and opportunities in those sectors. SRGB has extensive experience in undertaking training need assessment (TNA), designing and delivering professional training programs, workshops, seminars, etc. on management and development issues for various local and international organizations. SRGB has conducted many environment sector studies involving environment impact studies (EIA), cleaner production & energy efficiency (CP-EE), environment, health and safety (EH&S) audit, etc. SRGB has a rich experience in procurement & contract management. We have worked as the procurement specialist and procurement monitoring & evaluation consultant for many national and international organizations. Project designing & development, organization, monitoring and evaluation (M&E), project monitoring & impact evaluation, project cycle-management, financial concepts, international project management, procurement monitoring & management, etc. Analysis of social, political and economic conditions, market studies & research, sector analysis, financial and support programs, best practice studies, Delphi studies, potential analysis, scenarios, project and program evaluation, etc. Corporate Re-engineering/Re-structuring, management system development, management support services, public management & institutional development, enterprise & SME development, banking & financial services etc. 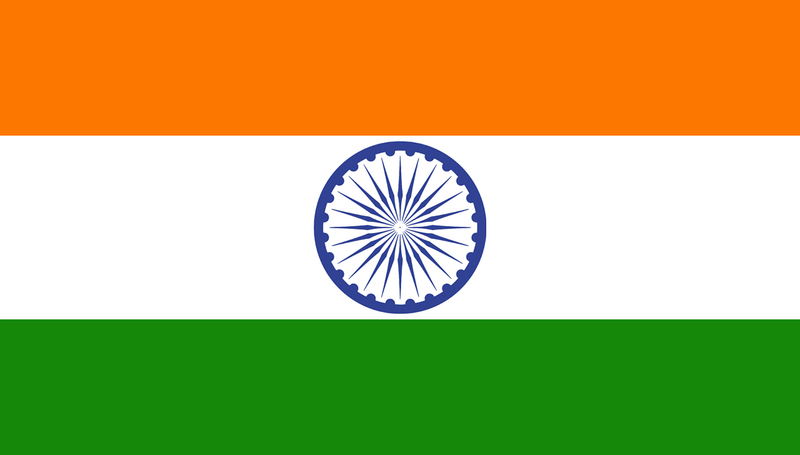 Agriculture & forest, environment & climate change, fishery, poultry & livestock, energy & power, telecommunication & IT, health & population, education & training, water & sanitation, textile & jute, transport & infrastructure, tourism & hospitality, media & publication, rural development & poverty alleviation, law & justice, democracy & governance, etc. 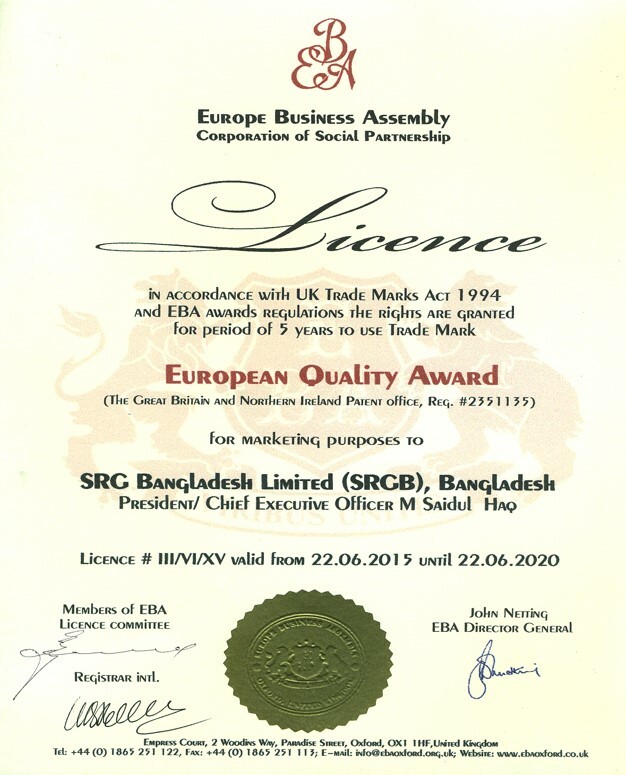 SRGB has received the European Quality Award 2015 at Montreaux, Switzerland awarded by European Business Assembly (EBA) and issued Quality License in accordance with the UK Trade Marks Act 1994, The Great Britain and Northern Ireland Patent Office. SRGB has been honored by the European Society for Quality Research with “ESQR Quality Achievements Award 2013” at London, UK in recognition of SRGB’s extraordinary achievement in quality management based on the principles of ESQR Quality Performance Model (QPM). 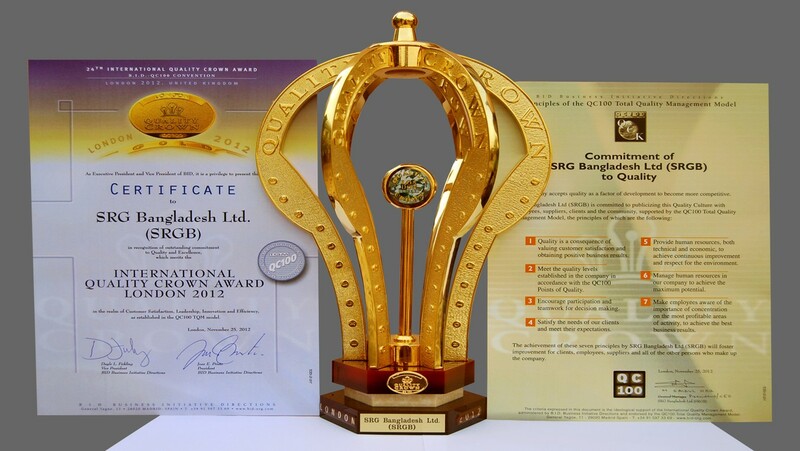 SRGB also received the “International Quality Crown Award 2012” in recognition of its strong commitment to quality and excellence. SRGB is made up a team oriented towards the continuous improvement of processes, striving for an important role in the leadership of the business world. 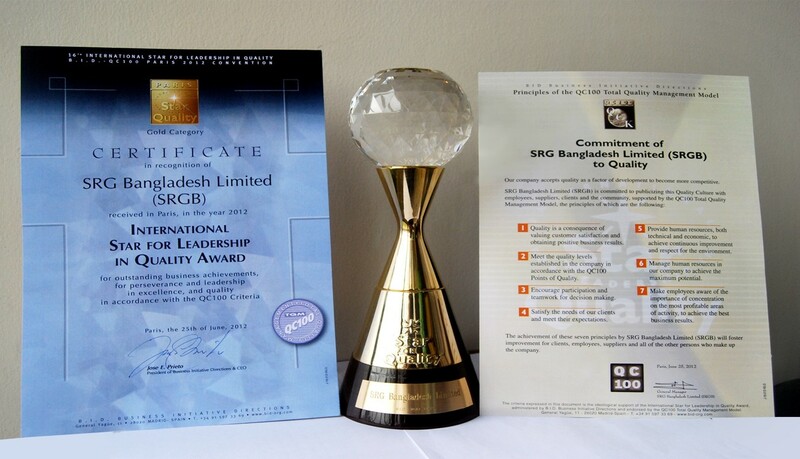 SRG Bangladesh Limited (SRGB) has received the “International Star for Leadership in Quality Award 2012”. Recognized for Commitment to Quality, Leadership, Technology and Innovation, SRGB represents success for Bangladesh in the Business World. SRGB is a member of The Worldwide Independent Network of Market Research (WIN), a global network conducting market research and opinion polls in every continent. All the network participants are the largest independent market research and polling companies in their respective countries. In the years, WIN has demonstrated wide competences and ability to conduct multi-country surveys following the highest standards requested by the market. The accumulated expertise of the Association is formidable: Third World issues, advertising and media research as well as retail, economics, and corporate research. 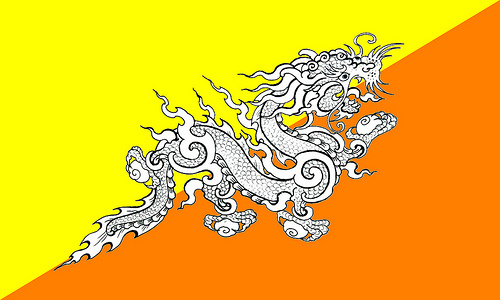 Phone: +88 02 55040915, 55040916, 55040917, 55040918, 55040919, 55040920. Research: +88 02 55040924, 55040925. Recruitment & HR: +88 02 55040927.